Having experienced the walk along the main road from Clay Bank Top to Gt.Broughton the previous afternoon, we weren't in a hurry to repeat the experience, particularly as the return would be uphill, adding an extra 2.5 miles on top of what was already going to be a long day. We had therefore taken the opportunity to book a lift back to Clay Bank Top with the daughter of the lady who's house we were staying in. She lived in the house next door, so as soon as we finished breakfast all we had to do was walk outside for our lift. We had breakfast in the conservatory with another couple who were staying in the guest-house. The male half of this duo was a rather dour man and conversation didn't really flow as it normally does in these situations and with breakfast over, we returned to our room to retrieve our gear. Having paid our bill for the overnight stay and lift, we headed out to the car with the daughter to discover that it had just started to rain. The three of us sat in the car waiting for the couple to appear as they had taken the opportunity of a lift as well. Despite the fact that they knew we were all waiting for them, they kept us waiting a good fifteen minutes before eventually appearing at the front door and squeezed into the car without apology. Soon, we were deposited on the roadside at Clay Bank Top where we said goodbye to the old woman's very sociable daughter, who's name I have unfortunately forgotten. I cannot remember her mothers name either but she was a charming old lady who was well into her eighties but obviously enjoyed the company of Coast to Coast walkers who I think she saw as being slightly eccentric. She may well have a point! 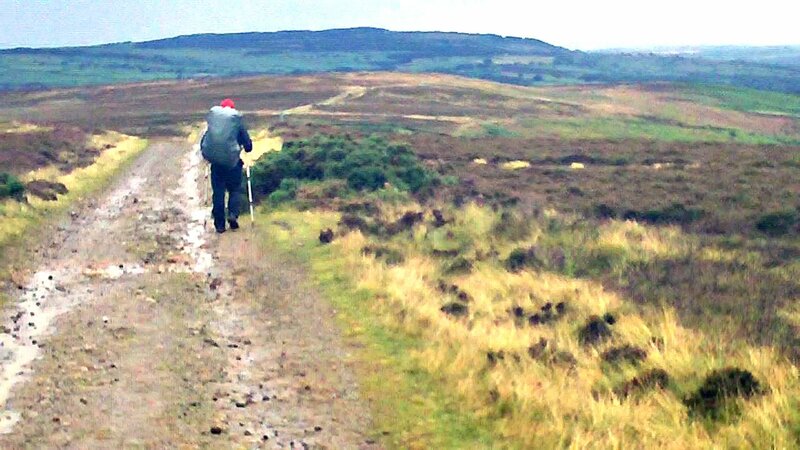 Soon, we were on the track and climbing onto Urra Moor as the rain began to get heavier. 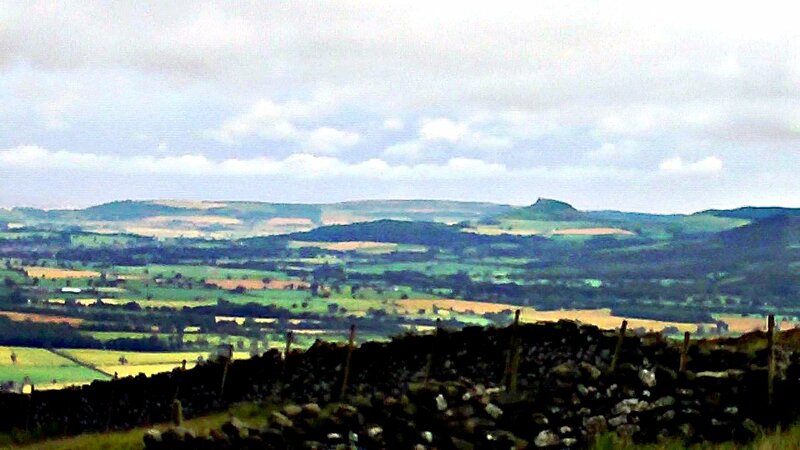 We had a distant glimpse of Middlesborough, which I think is probably the best sort, and also the curiously shaped hill of Roseberry Topping in the distance as we began to catch walkers struggling up the hills ahead. One in particular was obviously having problems as he seemed to be labouring very badly and as we passed him, his friends came back along the path, to check on his whereabouts. The weather had by now turned nasty and we were once again faced by torrential rain but this time, as well as the strong winds, we had drifting fog to add some variety. The North York Moors are excellent walking terrain with wide tracks crossing them, some being old railway beds that once served the ironstone mines. We soon arrived at a junction of tracks known as Bloworth Crossing where we joined the route of the old Rosedale railway and 'chugged' along this level track as it wound around the heads of the valleys below. Although the railway line meant that the going was easy as now we had a wide, firm track to follow with no inclines, after a few miles it became quite tedious as we could see the rail-bed stretching ahead for long distances as it wound around the valley heads. With no variation in the ground underfoot and views almost non-existent in the rain and fog, we seemed to be walking but not getting anywhere, as there was nothing by which to gauge our progress. At times, we were slowed by the wind and rain blowing strongly into our faces, and when the mist cleared, we had brief glimpses into the green valleys far below. After almost three hours of battling the elements, we left the Rosedale Railway at a sign for the Lyke Wake Walk, which signalled that we were at the Lion Inn at Blakey. Soon, we arrived at the edge of the road with no sign of the pub anywhere. After consulting the map, we realised that we must have been virtually on top of it and as we stood looking around a gap opened up in the mist and the shadowy shape of a building emerged from the gloom a couple of hundred yards away. We entered the pub via a small lobby that was packed with wet walking gear and rucksacks and we had soon stripped ours off and headed to the warm, inviting bar in our wet clothes. This being Sunday, the bar was rapidly filling up with people arriving for Sunday lunch but we managed to find a small table and ordered a beer and warming soup with a bread roll. As we had entered the bar, we had been greeted by Otto, one of the walkers from the campsite at the Blue Bell in Ingleby Cross two nights earlier. He informed us that the rest of the group from the pub had all left early that morning but he had stayed because of the inclement weather, hoping for an improvement that was forecast for later in the afternoon. Judging by the weather we had just left outside, he was in for a long wait! We had first encountered Otto many days before on Ravenstonedale Moor en-route to Kirkby Stephen, as he lay stretched out on the grass in the sunshine resting on his rucksack and this was to be the last time we would see him as he disappeared outside and didn't return. As we sat enjoying our beer and soup, the couple we had eaten breakfast with at the guesthouse came in and we made polite conversation before they headed off to the bar. They were finishing for the day at the pub where they had a room booked so we wouldn't be seeing them again either. After finishing our beer and soup, we reluctantly decided to head off out into the elements once again before getting too cosy in the pub. Putting our wet walking gear back on was quite an unpleasant task but soon we were on our way heading along the road in the mist and rain. Leaving the road, we followed a footpath slippery with mud across the moors and as we skirted around the head of the peculiarly named Great Fryup Dale, the weather finally relented a little and we had good views along the valley. 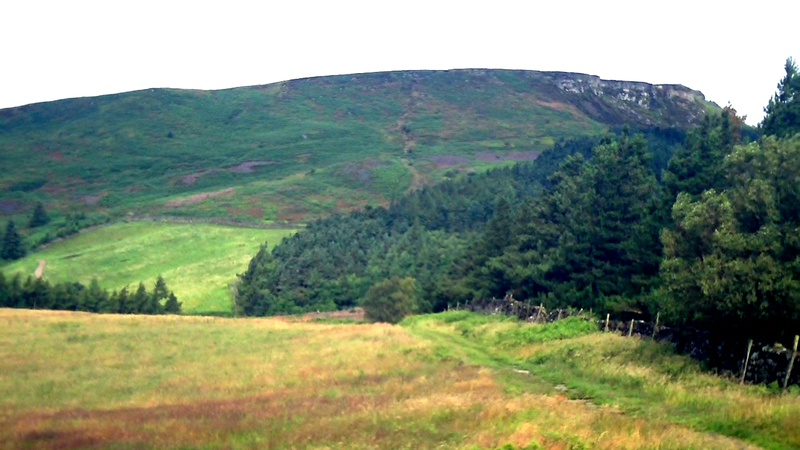 Reaching a country road, we followed it for a short distance before picking up a wide track along the summit of Glaisdale Rigg and began descending to the village of Glasidale and our overnight stop. The weather by now had become showery and we could see a 'curtain' of rain falling on pine plantations across the Glaisdale valley on our right. When I had walked this section in 1998, I had enjoyed hazy sunshine as I strolled down the airy ridge and arrived in Glaisdale after a relaxed walk on what had seemed a fairly easy day. Today was a much different affair and it seemed an age before we reached the outskirts of the village and descended to the Arncliffe Arms, where we had a room booked for the night. The room was perfectly adequate but very small and we had enormous problems deciding what to do with all of our wet gear and large rucksacks. In the end, after we had showered, we put our dripping clothes and boots in the shower where we hoped they would dry overnight. Later that evening, we went to the bar where spoke briefly to a couple who we had met a few of times at various points along the way since leaving Reeth. As we sat perusing the menu and enjoying our beer, two young Belgian lads who we had first seen many days ago in Shap came in. We had a chat with them and discovered that they were staying a mile or two away on a campsite. As they were on a tight budget they were looking for something cheap to eat and had decided on pizzas, which was about the cheapest thing on the menu. I was thankful that we had the means and opportunity to be able to dry out in a bed and breakfast and pick what we wanted from the menu. Eventually, we retired for the evening after checking with the bar that the earliest we could get breakfast was 8am. We had one day to go and hoped that we would be able to finish in Robin Hoods Bay in better conditions than we had experienced over the past two days.